You looking for a great festival with lots of luxembourgish music in its diverse styles? Well, what if we told you that we play such a festival in August this year? What if we told you that the festival in question is so cheap that you just have to go there? 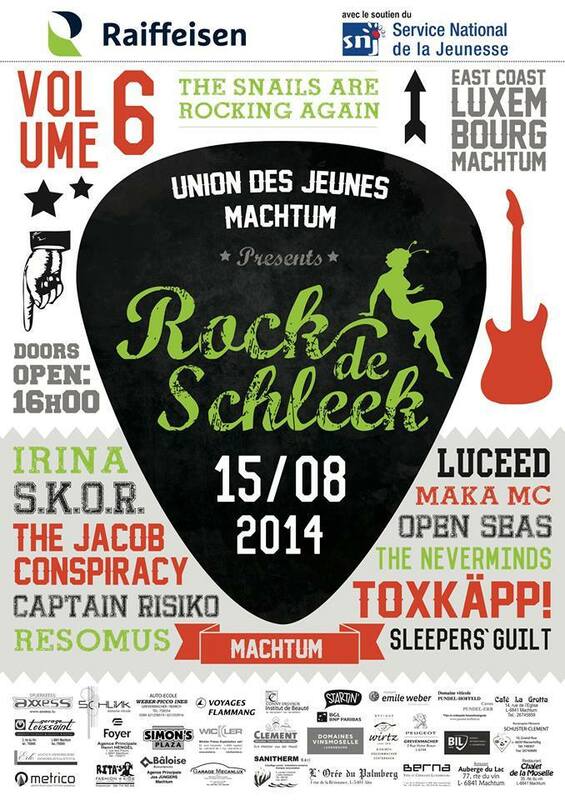 From now on we sell tickets for Rock De Schleek 2014 in Machtum for ONLY 5€! This entry was posted on 28. June 2014 by Sleepers' Guilt. It was filed under Shows and was tagged with 2014, IRINA, Luceed, Machtum, Maka Mc, Neverminds, Open Seas, Resomus, Rock de schleek, The Jacob Conspiracy, Toxkäpp!, We smell!.